Visit paradise: Cheap flights to Seychelles for €489! Etihad now offers cheap flights to Seychelles from Austria/Germany. Multicity tickets Vienna – Mahe – Frankfurt are available for only €489! This is amazing price because standard fares usually cost around €1000 for return flight. You can also fly back to Munich for few Euros more. Travel dates are from October until 10th December 2014. 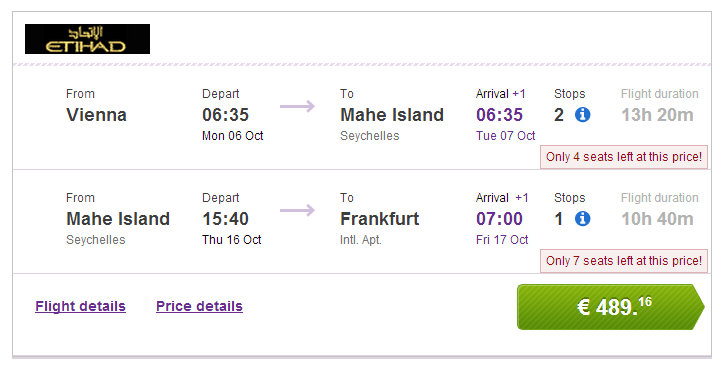 Book via Budgetair to get this awesome price (click on Show extra search options to enter return to Frankfurt). as always, if you can share our facebook page on your wall it will be highly appreciated! « WOW! Cheap fligths to Sri Lanka for only €259!